8x8 Barge-Monitor-Whisper (BMW) is an excellent tool that helps office managers and supervisors to monitor phone conversations of employees in the organization with customers or others. Whether it is to ensure quality of customer service, to coach new agents during a conversation, or to interrupt a live call for an emergency, 8x8 Barge-Monitor-Whisper gives you flexibility in your call center. 8x8 Barge-Monitor-Whisper (BMW) helps office managers and supervisors to optionally listen in on any active call in your phone system; whisper exclusively to the user being monitored (without the other party hearing), or actively join the call and make it a three-way conference. Configure one of your BLF keys on your phone extension to check for the busy status of the user. Log in to the Virtual Office desktop app or Virtual Office mobile app to check for the busy status of the user. Log in to Switchboard Pro to check for the busy status of the user. Log in to Virtual Office Analytics to observe active calls (which indirectly indicate a busy status). Ensure professional quality of customer service or customer support. Coach new agents during a phone call. Enable supervisors, receptionists, or admins to monitor then barge into live calls for important or emergency interruptions. Choose whether to alert users when a supervisor starts monitoring. Choose whether to use a password for additional security. Front Desk Receptionist: If there is a high-priority call for an employee who is currently busy on another call, the receptionist could simply barge in and inform the user of the important call. Sales Team Supervisor/Call Center Supervisor: Supervisors can silently listen to the agent's calls with customers to ensure that a high quality of service is delivered, and barge in on calls when necessary, creating a three-way conference call to rescue or assist the transaction. Group Trainer: A group trainer can listen to calls handled by group members and coach them live about phone etiquette, either whispering to them during the call or advising them after the call. To set up BMW, create a BMW group and add users who need to be monitored. You must also assign an administrator to the group who monitors the members of this BMW group. You can enable a monitoring tone to play and notify users who are being monitored, and require administrators to enter a password before monitoring a user. Barge permissions are granted to primary extension users only that excludes extensions associated with call queues, ring groups, virtual extensions, or auto attendants. In other words, only users can be part of a BMW group either as a member or administrator. Go to Home > Work Groups > Barge Monitor Whisper Groups, then click + Create BMW Groups. Enter a Name for the BMW group, and select a Site. Users must belong to a site. If you have only one site, the site is automatically selected. Select a BMW admin under Group Admins. A BMW group admin is a user with privileges to barge and monitor the phone conversations of the members of a group during an agent’s call. The BMW admin is automatically added to the list of admins when you assign a certain license to the user in the user profile page. The BMW admin is not restricted to one site, but can be selected from any available site in the phone system. For details about Virtual Office administrators, see our content on Assign Admin Rights to Users. Add Members to the BMW group, and click Save. The BMW group lists the users whose calls you can monitor. You can search for users by first name, last name, or email address. You can select members from all sites within the same phone system (PBX). Only users with extension numbers can be added to the list. A BMW group administrator must use a desk phone or softphone for this feature. Users must be added to the BMW group individually in Configuration Manager by the phone system administrator. A supervisor who is silently monitoring a call decides to enter the conference bridge, joining what then becomes a full three-way conference call, in which all three parties can hear each other. When the supervisor enters the call, a barge tone is played to alert all three parties. To barge in and join the call that you are already monitoring, dial <*5> or <*J>. To exit the barge and revert to silent monitor mode, dial <*6> or <*M>. 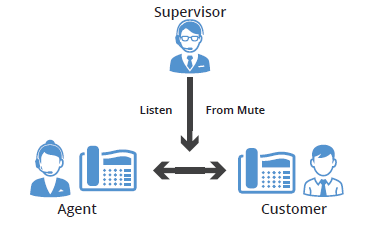 A supervisor silently monitors a normal two-party call answered by (or originated from) an 8x8 user on a conversation with an external party or customer. No audible sound would alert the agent or the customer that the conversation is being monitored. The supervisor is muted. The privilege to monitor calls (with or without a warning tone) can be granted to the supervisor by the phone system administrator. Note: Please be aware that many jurisdictions require businesses to notify workers and callers about call monitoring or recording and obtain their consent. For details, please refer to Compliance and Privacy Notice. Dial <*22> or <*BA> before lifting the handset. At the prompt, enter the user's extension number you want to monitor. You may be prompted for a password. Enter the password to begin monitoring. 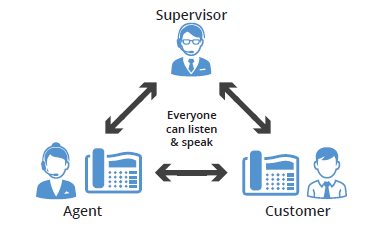 A supervisor silently monitoring a call between an agent and a customer can privately speak to the agent, without the customer hearing the discussion. When the whisper feature is activated, the supervisor can begin speaking to the agent. This is one-directional audio from supervisor to agent. The customer does not hear the whisper, while both the supervisor and the agent can hear the customer. To whisper to the agent who you are already monitoring, dial <*9> or <*W>. To exit the whisper, mute the supervisor audio, and revert to silent monitor mode, dial <*6> or <*M>. A supervisor can also barge directly in on a call without monitoring first. This facilitates instant collaboration. Dial <*23>, then dial the extension number. You are immediately placed in a three-way conference call with the active call. You can also create a speed dial by combining *23 with the desired extension number: if you want to reach extension 1001, for example, you can create speed dial number <*231001>. 8x8 Barge-Monitor-Whisper helps managers and supervisors to monitor phone conversations of employees with customers or others. Inform workers and callers that a call may be monitored or recorded and the purposes for which the information will be used. Obtain consent to the monitoring or recording. If a caller proceeds with a call after hearing it will be monitored and recorded, consent may be implied. Provide practical alternatives to callers objecting to monitoring or recording, such as communicating in writing. Limit the uses of the information collected to the purposes specified to workers and callers. Comply with general privacy obligations regarding collected information, such as safeguarding it and providing access to it for purposes of updating and correcting it. Nothing in this notice constitutes legal advice, and if you have any questions about applicable privacy laws, please consult a legal professional. How do I notify the agents that are being barged in on? While creating or editing BMW, enable Play Monitor Tone. This option alerts the group member with a beep when an administrator starts monitoring. How do I prevent system misuse? Administrators can prevent misuse of the system by prompting for a password. The user is required to enter the password to be able to monitor a call. How do I edit or delete a BMW? From the main menu, go to Home > Work Groups > Barge Monitor Whispers Group. To edit, click next to the desired group. To delete a BMW, click next to the desired group.